I work at the farmers market every Saturday and am always inspired by people who buy cases and flats of fresh fruits and veggies. They tell me they are going to can / preserve / make jams and jellies out of them. I always thought that making jam or preserves would be too hard for me until I started googling a few recipes. Lo and behold, it is not hard, just a bit time consuming. So last week I bought a flat of raspberries from one of my favorite farmers and went home and made Raspberry jam. But not just any raspberry jam. 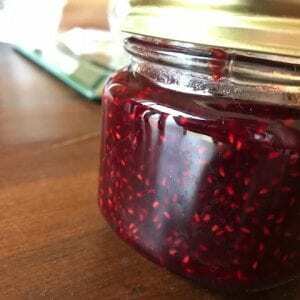 I made Raspberry Balsamic Jam with our sweet Blueberry Balsamic Vinegar. I think you could a bunch of different yummy combinations though, like strawberries with Lavender Balsamic, Blueberries with Peach Balsamic… combos are endless. This particular recipe is below. NOTE: this is a NO PECTIN added jam. I like the idea of just some fruit, sugar and acidity. It is tempting to reduce the sugar, but from everything I’ve read, sugar helps the jam set. If you find a lower sugar recipe, send it my way! If you make this, be sure to follow proper canning instructions. Here is the link I followed : 6 Trusted Ways to Sterilize Jars. Put a small white plate in the freezer along with a couple of spoons. You will use these later to test if the jam has set. Sterilize your jars according to amount of berries you have. 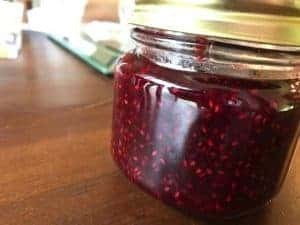 For this recipe, I had 8 cups of raspberries and made about 8.5 jars of jam in half pint jars. For example, if you have 3 pints of berries, you probably need 3 half pint jars. Just to be on the safe side, sterilize an extra jar. In a large pot, cook raspberries and sugar over medium low heat. As the berries cook down, remove the foam with a spoon. Crush the fruit with a potato masher if needed. Raspberries fall apart naturally so you probably don't need to do this. Add lemon juice and vinegar to the mixture. Turn up the heat to high and bring fruit mixture to boil. Stirring frequently so the fruit doesn't burn, you should start to notice a thickening of the jam. Start to test with the frozen plate method. Drop a spoonful on the cold plate and put back in the freezer for 2 minutes. When you take it back out, run your finger through the jam. If it comes back together quickly or is runny, continue cooking your jam. If the jam stays separated on the plate, you are ready to can. Another test is the frozen spoon method. Take a spoonful of jam and if the drips are slow, jam is ready. If they are fast and not as thick, continue cooking. Remove the pot from the heat. I didn't strain out the seeds in my jam. If you want to though, just set a fine mesh sieve over a pot and ladle the jam into the sieve or strainer and press the jam through. This was too much work for me so I just started canning the jam into my sterilized jars leaving 1/4" head space and then into the hot water bath for 15 minutes.